Unaccompanied Flute. Composed by Johann Sebastian Bach (1685-1750). Woodwind Solos & Ensembles - Flute Studies. Southern Music. Classical. Collection. 160 pages. Southern Music Company #B432. 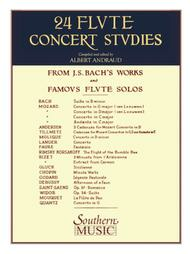 Published by Southern Music Company (HL.3770628). This extraordinary flute repertoire collection is a tremendous value for the serious flute player/student. 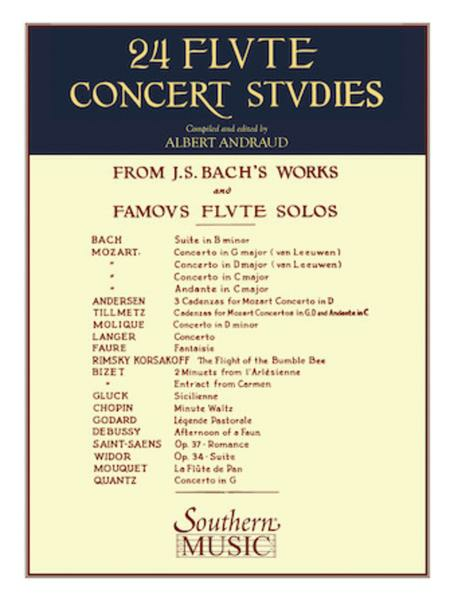 In addition to the studies based on the works of Johann Sebastian Bach, it includes the following flute repertoire (flute solo parts only): Bach – Suite in B Minor; Mozart – Concerto in D, K. 314; Debussy – L'apres-midi d'un faune; Faure – Fantaisie, Op. 79; Bizet – Entr'act of Act III of Carmen; Rimsky-Korsakoff – Flight of the Bumble Bee; Chopin – Minute Waltz; Saint-Saens – Romance, Op. 37; Ravel – Pavane pour une infante defunte; and more. First used this with my teacher 30 years ago. The Bach studies are great combination of exercise and enjoyable music, taken from Bach keyboard and other pieces. All play well on flute. The new binding is particularly nice. 16 of 32 people found this review helpful. , it's hard to complain. this is an amazing book for the intermediate/advanced flute player(in terms of high school playing). please check it out. 25 of 42 people found this review helpful.